Wheng in Manila: Hot Off the Press! Sumo Sam’s Olympia, Makati Avenue Branch is now open! Hot Off the Press! Sumo Sam’s Olympia, Makati Avenue Branch is now open! If there’s one kind of cuisine that’s popping up a lot in Makati Avenue area, it’s definitely Japanese! Sumo Sam is definitely the place that will satisfy our cravings for the Japanese cuisines as it opens its 25th store at the centrally located Olympia building in Makati Avenue. Following the tenet of ‘Big Is Beautiful’, Sumo Sam Olympia is the biggest location to date with about 300 sqm of dining space. The set up is also a bit of a departure from the fast casual dining restaurant that Sumo Sam usually has. Some of the chairs have been replaced with comfortable sofas with throw pillows, making it not only an ideal place for dining but also for lounging and spending more time with friends and family over food, wine, cocktails, coffee and desserts. “The look of our restaurants depends on its location and what our guests ask for. For a time now, we’ve always wanted to have a bigger space to accommodate our guest’s requests to celebrate with a large group in the restaurant and now they finally can,“ Sumo Sam general manager Adolf Aran Jr. says. In Sumo Sam Olympia, 300 sqms has been divided into 3 smaller spaces that can be enclosed and booked separately or the entire restaurant can be booked for bigger functions. Valet parking is available and special requests can be made to make it a truly enjoyable event. What’s more exciting about this new location is that it will be offering a daily buffet at P499.00 per person for lunch and dinner everyday - offering a selection of fresh salads, their best selling sushi, hot ramen, delectable unlimited tempura and delicious desserts to everyone’s delight. Of course, for those who prefer ala carte, with all the bestsellers among them, are the Ebi Tempura, chicken Teriyaki, and Spicy Tuna Salad, and Seafood Yakisoba can also be ordered. New on the menu and just in time for summer, Sumo Sam has come up with refreshing ice pops with interesting flavors such as green tea, choco banana, pistachio, red bean and black sesame. Worth trying is the trio of flavors served in cubes on a small tray – wasabi with nori garnishing, avocado with silvers of mango, and strawberry flavor. “This is truly a wine and dine location for all times” Aran says. With a carefully selected wine list, cocktail drinks that are especially concocted for Sumo Sam and a later bar menu, guests are encouraged to relax and enjoy the posh interiors till late. The SumoSam Olympia branch also serves breakfast for those who want a delicious and healthy start to the day. And for those who want to enjoy at their office or at their home, delivery service is offered. Close at the heels of the opening of its 25th store, SumoSam opened a few more locations in SM Manila and in Ayala North Point in Bacolod. “Last Year, we were looking forward to the opening of our 20th branch. Now, we are already getting ready for our 30th,” Aran says, referring to the fast pace of the chin’s growth in recent years. It opened its first restaurant in 2005. Before 2011, Sumo Sam, had only four branches. But within the past two years, the chain has expanded nationwide, from up north at the Ayala technohub mall in Baguio, to down south at Ayala Centrio mall in Cagayan De Oro. Its first franchised branch opened in Abreeza mall in Davao in 2011. Sumo Sam is often associated with popular actor-restaurateur, Marvin Agustin who owns the restaurant together with his business partners, accomplished businessmen and restaurateurs Raymund Magdaluyo and Ricky Laudico. “Marvin embodies the brand’s values because “Sumo Sam is a winner.” This partnership of three friends shows how friendship can be trsnscended even by going into successful business partnerships and by creating concepts that can withstand the test of time. “Sumo Sam will be creating more milestones this year, in terms of expansion, new menu concepts and other innovations”, Aran says. This will keep our guests keep coming back for more. 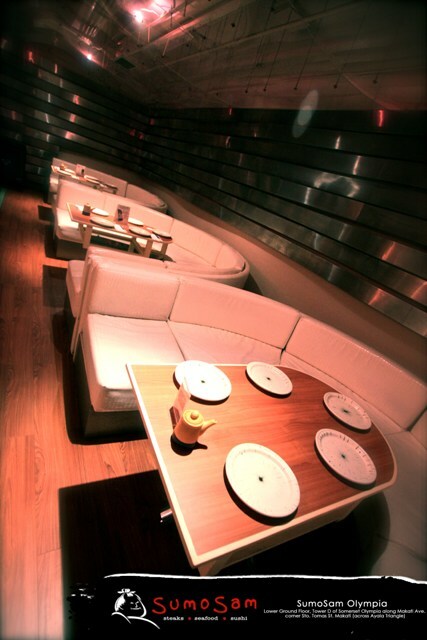 For reservations, deliveries and event inquiries on SumoSam Olympia call 0917 7067328. Checkout more photos from the event here --> Sumo Sam Olympia Grand Opening.